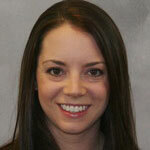 Personal Training Coordinator, Brittany Skillman has worked in the RFC at SAS for 8 years. She holds degrees in both Exercise and Sport Science and Psychology from the University of North Carolina at Chapel Hill and holds multiple professional certifications. A Raleigh native, Brittany spends her free time with her family, including husband and fellow SAS employee, Shawn, daughter Tatum and son Penn.